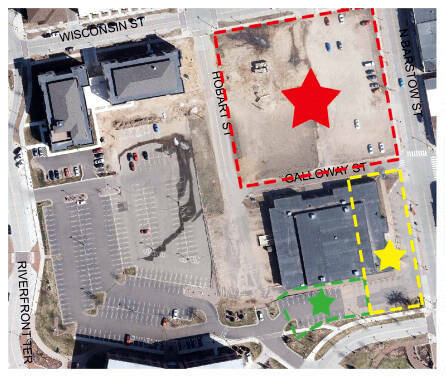 The first location is currently a parking lot; the second is envisioned as the site of a “liner” building between the street and the parking ramp. Mike Schatz, the city’s economic development director, said the agency didn’t make a formal request for proposals, which would have given developers a specific set of requirements. Instead, in response to inquiries from developers, the city gave all interested developers a deadline: noon on Friday, Sept. 28. Schatz said they’ve heard from three firms so far – two local and one from out of the area. A previous request for proposals for the sites, which was issued in 2015, resulted in only one plan – a proposal by Commonweal Development to create a mixed-use development with a public market – which ultimately went nowhere. Schatz says he expects the new proposals also will include a combination of retail, residential, and office space. Proposals should be submitted electronically to mike.schatz@eauclairewi.gov.